Add a generous amount of vegetable oil to a pot over medium-high heat. 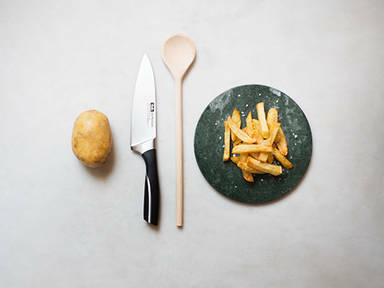 Peel potatoes and cut them into thick batons. Add salt and paprika to a small bowl and mix to combine. Carefully add potatoes to hot oil. To maintain the correct temperature, make sure not to add too many potatoes at once. Fry for approx. 2 min. Transfer the potatoes to a paper towel-lined plate and let rest for approx. 5 min. Transfer fries back into the pot and fry for another 2 min. Remove from pot and season to taste with the seasoned salt. Enjoy as a side with burgers or all by themselves!